Many times you will need to open artwork that has been created in another program. There are several ways to accomplish this. File>Open will allow you to choose an image to be opened. File>Import will import an image into Fireworks. Both Bitmap and Vector images that have been created in other programs can be opened or imported into Fireworks. It is in Converting and Exporting Graphics that Fireworks earns it's wonderful reputation. After you have created an image you need to save it as a PNG (so that you can make changes later if need be). Once the image is saved in PNG format you have to Export it to the file format you need for your artefact. 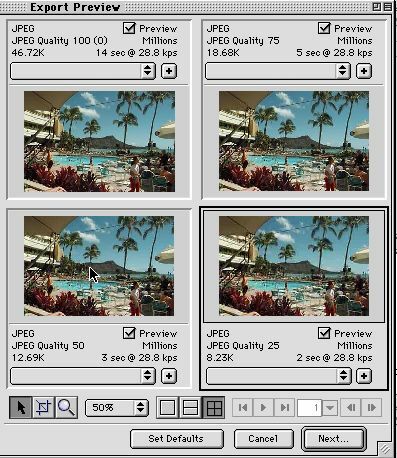 As you know, the rule of thumb is that images that are photographs need millions of color to display properly and should be exported in JPG format. Images that are drawn or text should be exported in GIF format. So, why wouldn't you always save a JPG at a higher quality? Because, as you know, the higher the quality of an image, the larger the file size of that image. By using the 4-Preview option in the Export Preview you can see and compare the file size of a image at four different quality levels. Fireworks allows you to use a slider bar to adjust the quality of a JPG for export. As you can see in this example a JPG at 80% quality looks better than a JPG at 20% quality.